This project was developed as a five-week advanced technology topics course in the Department of Architecture. 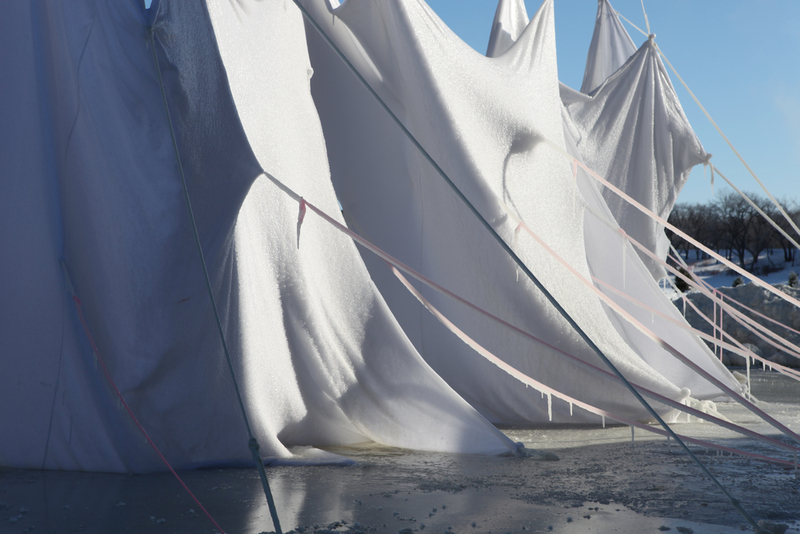 The aim was to have masters level students design and build fabric formed ice structures to explore the architectural potentials of the particularly harsh winter climate of Winnipeg. In this class the students worked with analogous models of fabric structures and proposed how they might install them on two sites that were pre-selected. The first was the courtyard of the J.A. Russell Building on campus for the Atmosphere Conference. The second site was located at the Forks to participate in the Winter Warming Huts Competition. The two projects show differing approaches to working with this building method. One is through the use of temporary scaffolding to raise fabric columns with rigid struts within the cavity of the wall, so that the pressure of pulling accentuates the lateral forms (fig. 1, 2). The second is through the use of existing scaffolding (being the potential surfaces of the site), in this case, a bridge on the Assiniboine River. The students built a mock-up of the bridge structure in the studio (fig. 3) and worked to design a 60’ x 12’ folded wall that would be pulled to it from the ice. Following improvisational play and refined shaping, the students recorded only the anchor points, and the directions of the forces (“actions”) that they used and translated them to the site at full-scale through drawing and locating these points (fig. 6) on the ice and bridge. After tying to the anchors, the ropes were used to temporarily pull the fabric wall into place while river water was sprayed from beneath the ice. When the icing was completed, the ropes were cut and the wall became free-standing, and a site for amusement for the ice skaters on the river trail. Vertigo Team: Veronica Angelatos, Mallory Briggs, Paulo Castillo, Jeffrey Del Buono, Daria Diakovska, Steven Gairns, Rei Kurosawa, Kaitlan McCormick, James Robertson, Dazhong Yi. Project Partner: The Forks Renewal Corporation, Marshall Fabrics.